Missionaries report being "completely overwhelmed" with the loss and trauma the Syrian refugees have experienced. We’ve all seen the horrifying images flash across our screens of Syrian refugees fleeing to Europe for their lives, and of those who didn’t make it. Many have been fleeing since the civil war began in 2011, but it seems like we’ve only recently seen this mass exodus in the news. But for one WorldVenture couple in Austria, helping refugees has been their daily reality for the last nine and a half years. The Jones* primarily work with Afghani and Iranian refugees; however, over the summer, they came in contact with a number of Syrians as well. That’s because their refugee center works mostly with those who decide to stay in Austria and obtain residency, and the majority of Syrians are passing through to settle in Germany. Austria agreed to help 12,000 Syrian refugees before gradually closing its borders to them. The couple has met many well-educated Syrian doctors and lawyers who are willing to get settled into their new culture and get back to work immediately. Part of the reason Mr. Jones said he believes that Germany made room to accept more than 800,000 refugees is because of a strong Syrian work ethic. One such story is about a man who showed Mrs. Jones a picture on his cell phone of all his friends and family members from his village, only to explain how they were all dead now. “I didn’t know how to respond. I was just completely overwhelmed with the loss in his life and how he could even—I don’t know—laugh or joke around,” she said. According to the United Nations, the current outflow of refugees from Syria is the largest since the Rwandan Genocide in the mid-1990s. Since 2011, more than 4 million Syrians have fled because of the civil war. A major reason why some countries, including the United States, have been hesitant to accept refugees is due to the fear that ISIS members might sneak into the country under the guise of a refugee. The Nov. 13 terrorist attacks in Paris, which left 130 people dead, has only intensified that fear; authorities found a Syrian passport next to one of the terrorists. However, with the majority of refugees staying in Europe or other countries in the Middle East, what are Christians doing to help them? Nicolette and her husband never set out to work with refugees when they first moved to Lebanon seven years ago. But in a place where one out of every four residents is a refugee, they soon found themselves helping out in that area as well. Many Muslims who were taught that Christianity and the West are evil are now disillusioned with Islam due to the recent violence they have experienced, and in many cases it’s been Christians who have helped them, Mr. Jones said. In addition to sharing the gospel, a lot of the Jones’ work also focuses on long-term discipleship. They help refugees learn German and assimilate into Austrian culture; they also befriend the refugees and hold Bible studies at the center. Likewise, WorldVenture missionaries Keith and Beverly Sellers, whose networks and churches work with refugees in Hungary, said that many Christian organizations have been partnering together to bring aid to the refugees and have made sure Bibles are available for pick-up to any of the refugees who want one. However, some of the local churches said that direct evangelism is unethical, and instead focus more on humanitarian aid. “Local Christians and missionaries in Europe need to mobilize and evangelize Muslims with every means possible,” Keith said. In some Muslim countries, like Iran and Afghanistan, converting to Christianity is punishable by death. This can complicate the reasons why some choose to become Christian, as the converts believe they are less likely to be sent back home if they’ll face persecution for their faith. There still is a small percentage of refugees that come to know the Lord as their personal savior, Mr. Jones said, and those few have been powerful witnesses to their own people. “Jordan, along with Lebanon and Turkey, is one of the three main refugee receiving countries in the Middle East. Syrian refugees began entering Jordan in 2011, and since 2014 have been joined by Iraqi Christians fleeing ISIS. 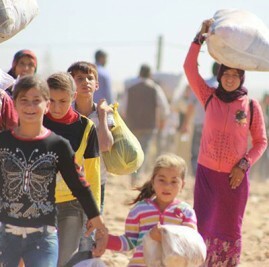 With over a million refugees now in the country, Jordan’s economy, social and political structure, as well as diminishing resources have all been severely strained. But in the midst of this has come the beautiful and compelling challenge of welcoming refugee guests into our country and helping them in holistic ways. Individuals, churches, and Christian NGO’s have worked hard to provide relief and trauma care as well as educational, medical and spiritual assistance to desperate, displaced people. The local Arabic evangelical church we are a part of has been reinvigorated as we all move out of our comfort zones to minister in new and creative ways during this time of human need.